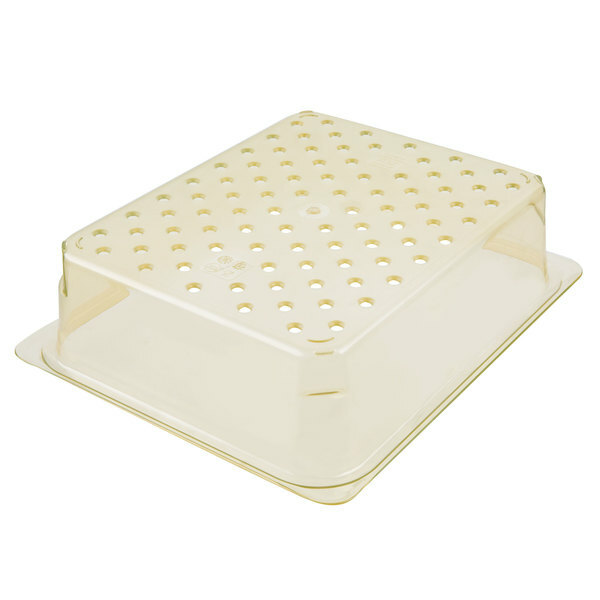 High heat food pans from Cambro offer extreme versatility in any busy kitchen. The standard H-Pans can be used to hold any type of food, but are perfect for hot foods like chicken, meatballs, or steamed vegetables. You can pair this standard pan with a high heat colander pan, which drains your food and keeps them from sitting in excess liquids or grease. This will help maintain the quality of your best foods so they look and taste great. 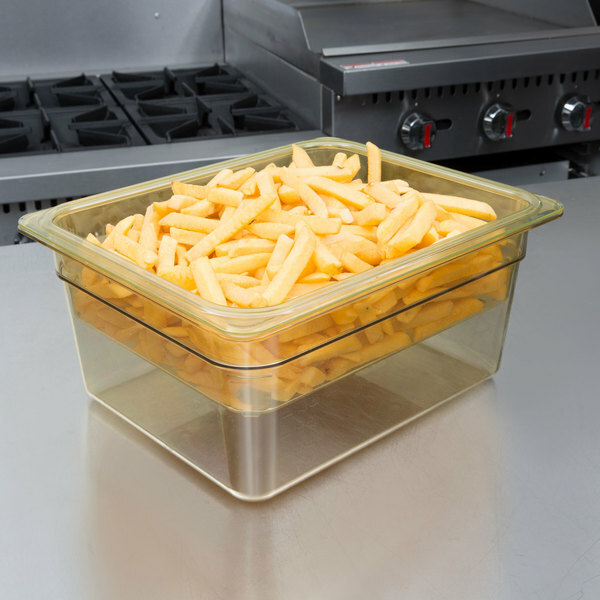 Cambro high heat pans are available in either a sleek and stylish black or a translucent amber color, making it easier to check the level of your food. For back-of-house use, these high heat pans can tolerate temperatures ranging from -40 to 375 degrees Fahrenheit. Whether you need to flash freeze foods or reheat food in the microwave, these pans can handle it. 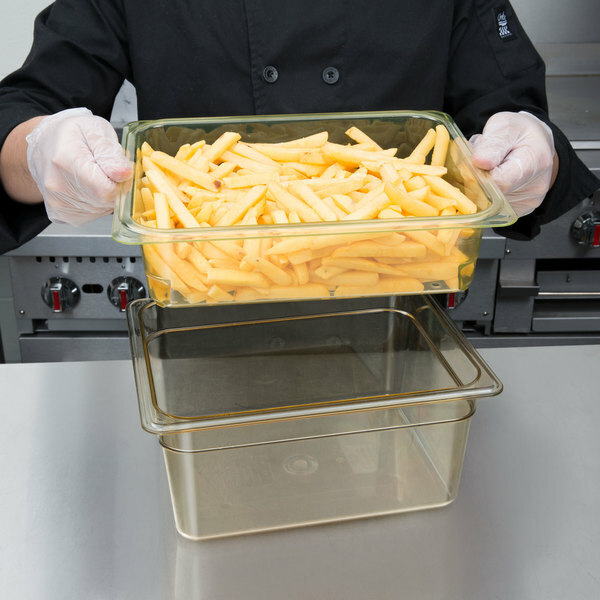 For front-of-house applications, the ½” flange on the pans lets them sit perfectly in steam tables or food bars to prevent steam loss, which helps maintain the quality and safety of your food. 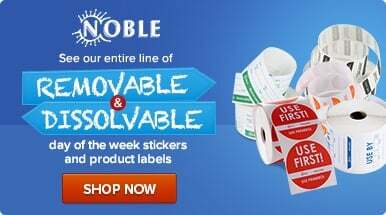 They also come in all of the standard sizes ranging from 1/9 size to full size, so you’re able to find exactly what you need. Inside the rim, the pans have both standard and metric gradations so you can check inventory levels at a glance. These pans also have a non-stick, smooth interior surface that allows you to store or serve any type of food without worrying about the food sticking to the pan. This helps increase your yield and reduce unnecessary waste, plus it makes the pan easy to clean. At the end of the night, these pans can go right into the dishwasher for quick and easy clean up. Once they’re dry, you can stack them together to maximize storage space. Made of FDA approved materials and certified by the NSF, you can safely use these H-Pans in any commercial kitchen. 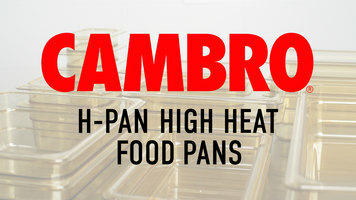 Choose Cambro high heat pans when you need versatile, reliable food pans in your commercial kitchen or buffet line. Stock your kitchen with Cambro high heat food pans so you can rely on the durability and longevity of your kitchen supplies. These pans are extremely versatile and able to be used in both hot and cold applications so you can store, transport, and serve all your foods in one container. 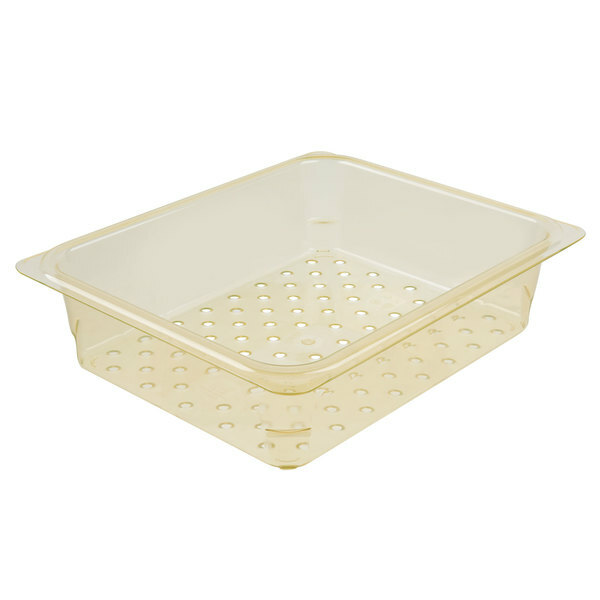 This amber Cambro H-Pan™ 23CLRHP150 3" deep high heat colander pan easily slips into a 4" deep (or deeper) 1/2 size food pan to drain liquids and grease away from hot foods, improving food quality. It's ideal for use in steam tables and buffet lines and can be simply lifted out of a food pan for safe and quick disposal of liquids as needed. To aid in storage, transport, and create more usable space, this colander will even stack with similar items.